Pristine ocean pools, buff lifesavers and golden beaches aren’t the only fabulous drawcards to Sydney – check out these 7 spectacular things to do in Australia’s largest city. Breathe in the salty air of Sydney Harbour and set sail on a yacht charter. There are plenty of yacht charters for a glamorous day out on the harbour sun worshipping with family and friends. Wave to the Manly ferry passengers as it chugs past and enjoy Sydney’s cityscape. Really, it’s the only way to discover the best of Sydney’s picturesque bays. To find the true essence of a city one must explore the nooks and crannies of a market. 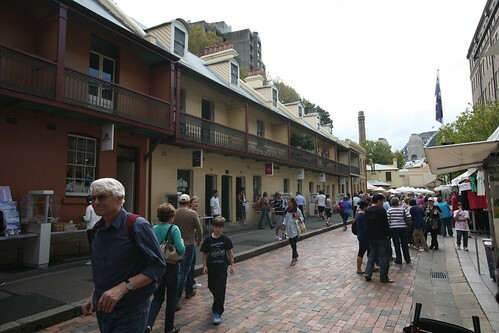 Discover the signature Rocks Market on a Friday, Saturday or Monday and wander around the charming historical precinct. Trawl through astonishing knick-knacks and chat with Sydney’s up-and-coming designers about their avant-garde creations. There’s everything from health and beauty to crafts and books. Nibble on fresh local produce, and stash souvenirs away for your best friend or nanna, and take in incredible views of the famous Harbour Bridge. You won’t forget this market, that’s for sure. Hit Glebe’s tree-lined pavement and immerse yourself in authentic Sydney’s terrace houses. Home to Australia’s first Prime Minister Sir Edmund Barton, this neighbourhood has plenty to offer. If you’re around in November, it’s worth experiencing the Glebe Music Festival, wander down to Margaretta Cottage, and sway along to the Balinese Gamelan to Nepalese Rock. Let’s face it. The hustle and bustle of a big city can sometimes get to be a little too much. Forget the concrete jungle for a day and catch the famous ferry to one of Sydney’s most iconic beaches, Manly. Whether you’re by yourself, or have got the whole tribe with you, give stand-up paddle (SUP) yoga a go. It’s the perfect way to take to the water and embrace your inner zen. Catch some more vitamin D on The Corso and enjoy the casual Northern Beaches atmosphere. Do you know your tempranillo from your Grenache? If you consider yourself a bit of a wine connoisseur, pencil in the Pyrmont Festival of Wine Food and Art in Pirrama Park during May. Mingle with Sydneysiders and enjoy a tipple of local world-class wine from Mudgee. Pair it with fresh produce from the land, sea and air, and admire the artwork and photography by distinguished artists at exhibitions and the Powerhouse Museum. Bliss! Get your hipster on in Surry Hills, and wander the leafy streets a stone’s throw away from the CBD. You can literally walk there from George Street and there are plenty of buses. Staying in Surry Hills is the perfect way to live like a local and break into the ultra quirky ‘hood it has become. The bustling Crown Street is brimming with stylish cafes dishing out top nosh and smooth coffee. Whether you feel like Vietnamese, tapas or Brazilian BBQ, this area has it all. Find peculiar gifts and visit art galleries for the ultimate Surry Hills experience. This district also has a thriving nightlife perfect for late night adventures. If you’re a bit of a fitness freak, this one’s for you. Book a cycling tour, which provides you with great information from Luna Park to Lavender Bay. Ride across the Sydney Harbour Bridge and stop off at intriguing historical and cultural attractions for an active and informative day out! Rebecca Parish loves hitting the sack in accommodation in Surry Hills, and enjoying Sydney’s trendiest suburb. Oh, and she’s got a love for smooth agave espresso martinis too.